Volunteer Trinidad trained at Piarco Nov 42. Lancaster ED 493, Pilot Sgt D McKenzie was lost on a bombing mission on Hamburg on 2 Aug 1943. They flew through the great storm and probably bombed south of the target. Flying well south of the return route, the aircraft was shot down at approx 0130hrs by an ME 110 nighfighter of IV-NJG, flown by Ofar K Scherfling. The crew were on their 7th mission of their 1st tour. Aircraft crashed into the sea just off the coast of Texel, Holland. All crew perished. Bodies never recovered. 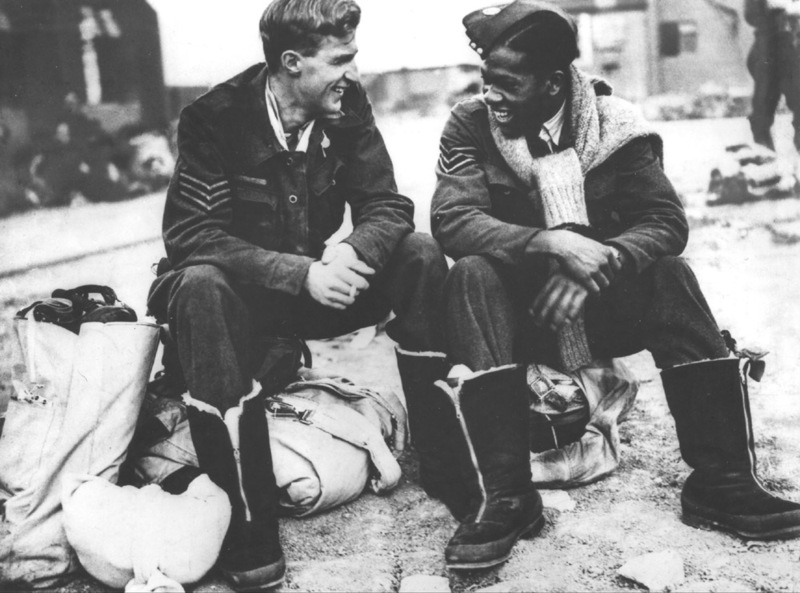 Most of this story is true, however Leslie and his crew were on their 9th mission and were returning home when they were shot down off the Coast of Holland at about half past three in the morning. I think 4 of the 7 men were later recovered and are buried in various Dutch cemeteries. Leslie, his fellow gunner ‘Willie’ Welsh and the crew’s Engineer were never found and are commemorated at Runnymede. I will remember them all. I can advise that my uncle, Donald Hector MacKenzie, as far as I am aware, was the sole survivor of ED 493 shot down over Hamburg on 2nd/3rd August 1943. Family tale is that he was put into a POW camp in East Germany that also housed french slave-labour used for road mending etc. My uncle was a fluent french speaker, having been born and brought up in Paris living there up and until they were forced to flee when the Germans rolled into France, and was able to infiltrate the french side of the POW camp. During a work party outside the camp he commandeered a lorry and headed off towards the Russian front. The Russians put him into a POW camp. With help he was able to escape through Finland and returned safely to UK. The story I can’t guarantee, but my uncle did survive the war. Your uncle, so you are Donald MacKenzie’s sisters son? Donald Hector MacKenzie is/was my father, never met the man, however your story matches verbatim what I have as the limited knowledge of his war time experience from my mother. Mac MacKenzie was married to a Canadian, in Hamburg. Shawn – very pleased to get your response – my mother and your father had little or no contact after their father died. You can view our family history on ancestry website. I have a few early photos of your father if that is of interest. There were firstly no survivors of the loss of the above lancaster. The captain was not Donald Hector MacKenzie but David Mackenzie from Scotland. He had two sisters, both of whom are now deceased, I believe. Andrew – many thanks for your advice (my family records have proved to be inaccurate). Reviewing the records it now seems likely he was a crew member of a Halifax that crashed near Asbach 10/11 August 1943. Plane based at RAF Snaith. He was POW in StalagLuft 6 Heydekrug – POW No. 1324. My grandfather passed away several years ago, but I am one of many grandchildren. It’s astonishing to see him sitting there on the left. My father is the second-eldest child of John C. Dickinson (1 of 4), who settled in Saskatchewan with an Englishwoman after the war. I’m interested in your grandfather’s service with 9 Squadron if you see this post and want to get in touch.